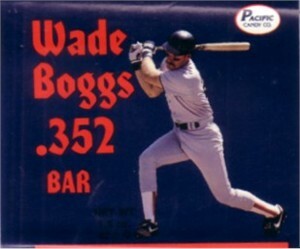 Wade Boggs chocolate bar paper wrapper produced and sold by Pacific Trading Cards in 1990. Measures about 3 by 3 inches flat. Excellent condition. ONLY ONE AVAILABLE FOR SALE (CHOCOLATE NOT INCLUDED, EATEN DECADES AGO).